California has experienced record heat waves and catastrophic fires in recent years, and climate experts say it is likely to get worse. A report released Aug. 27 by the state of California, the fourth in a series of assessments, puts the blame squarely on climate change. California Gov. 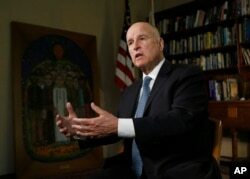 Jerry Brown is hosting an international summit, beginning Wednesday, in San Francisco to search for solutions. The worst fires in California’s history came this year and last, with the 2018 Mendocino Complex Fire scorching 186,000 hectares. Parts of northern California are still burning. 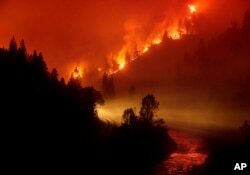 The largest of the fires, in Shasta County, has burned more than 20,000 hectares and is only 5 percent contained. 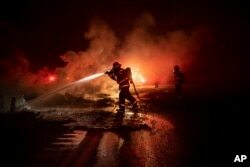 A firefighter sprays the smoldering remains of a vehicle on Interstate 5 as the Delta Fire burns in the Shasta-Trinity National Forest, Calif., on Sept. 5, 2018. The California Climate Change Assessment summarizes current climate research and finds a litany of problems caused by greenhouse gases, including carbon dioxide, which is emitted by the use of fossil fuels such as coal and oil. If nothing or little is done, the reports say to expect temperature rises of 3 to 5 degrees Celsius (5.6 to 8.8 degrees Fahrenheit) by 2100; a two-thirds decline in water supplies from the mountain snow pack by 2050; a nearly 80 percent increase in the area scorched by fires by the end of the century; and up to two-thirds of Southern California beaches eroding in the same time frame. From flooding to a strained electrical grid and premature deaths and illnesses, the list is extensive. “I think we’ve reached the point where the impacts of climate change are no longer subtle,” said Michael Mann, who directs the Earth System Science Center at Pennsylvania State University. Mann was not involved in the study, but said he thinks its finding are, if anything, conservative. “We are literally seeing them play out in real time in the form of record heat waves, floods, droughts and wildfires,” he said. The Trump administration, however, has pledged to overturn emissions curbs and has promised to withdraw from the 2015 Paris climate agreement, an accord of nearly 200 countries that requires national targets for emission cuts but which lacks enforcement powers. President Donald Trump said the pact is ineffective and kills jobs. Climate experts say something must be done to slow the climate shifts that are underway. 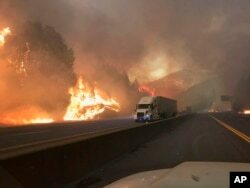 In this Sept. 5, 2018, photo released by the U.S. Forest Service, a truck drives next to the Delta Fire burning on Interstate 5 near Shasta-Trinity National Forest, Calif.
Epidemiologists are tracking health effects of the changes, from more pollutants emitted by fires to warming in the cities, said epidemiologist Rupa Basu of the California Environmental Protection Agency’s Office of Environmental Health Hazard Assessment. Basu was a contributing author to California’s climate assessment. “There’s a larger population living in urban areas, and more importantly, a larger vulnerable population living in urban areas,” said Basu, which she said become “urban heat islands” as temperatures rise. The report says that many rural communities, and Native Americans and other minorities, are disproportionately affected. Researchers are seeing more emergencies and deaths among the very young, elderly and poor. Analysts compare hospital and emergency room visits, infant birth weights, death and illness rates to temperature and relative humidity, researcher Xiangmei Wu said. On a global level, climate change can increase the ferocity of tropical storms because of changes to the jet stream that determine weather patterns, although hurricanes are not an issue in California. Dan Cayan, a researcher at the Scripps Institution of Oceanography and a coordinating lead author of the California report, said climate change exaggerates natural cycles such as El Nino, the periodic warming of equatorial oceans that leads to storms in the Pacific. He said more extreme weather events may well be on their way. “State and local governments and other players are taking this seriously. And I think that trend will grow as climate change symptoms continue to bubble up,” Cayan said, adding that he is cautiously optimistic that the world can mitigate the worst effects of the changes. Gov. Jerry Brown discusses the goals of the global climate summit he is hosting in San Francisco and legislation he signed directing California to phase out fossil fuels for electricity by 2045 during an interview with The Associated Press. Gov. Brown, who is hosting the three-day summit that ends Friday, has committed to reducing greenhouse gas emissions in his state to 40 percent below 1990 levels. Monday, Brown signed a bill requiring California to obtain all of its electricity from clean energy sources by 2045. Brown is a key figure in a coalition of local and regional governments that have committed to achieving the Paris accord’s limiting of global warming in this century to 1.5 to 2 degrees Celsius above pre-industrial levels, whether or not the United States remains in the agreement. The Delta Fire burns in the Shasta-Trinity National Forest, Calif., on Sept. 6, 2018. The California summit will look at ways to build consensus and avoid worst-case scenarios. Protesters who have gathered in San Francisco, however, say it is not enough. “There have been many climate summits with a lot of rhetoric but not enough commitment,” activist May Boeve told The Associated Press. She was one of thousands who marched through San Francisco last Saturday, calling for a transition to renewable energy sources and protections for workers and minority groups as the world braces for dramatic changes to its weather.